It’s about to get really cheesy up in here. I LOVE THIS RECIPE, there I did my all caps and freaked out a teeny bit about how super easy and kid friendly this skillet dinner is. I love pasta, but pasta does not always love me back so much. So I use gluten free pasta, and make something sensitive tummies and hard-core-wheat-tummies can eat too. 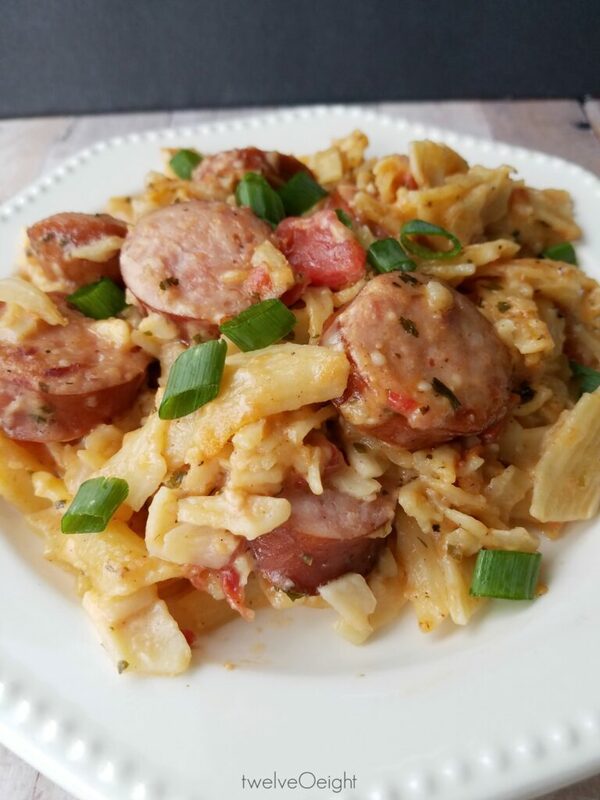 This is a 30 minutes or less recipe and there were no traces of this cheesy goodness on my family’s plates when we finished. That is always a good sign right? Saute your Kielbasa with a few tablespoons of olive oil, and your onion. 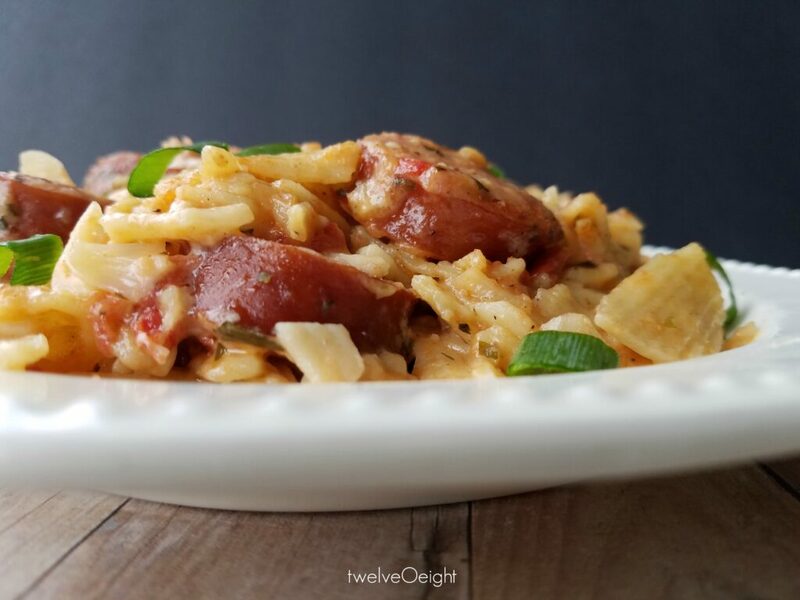 Once the onion is transparent and the Kielbasa is browning on the edges, add your garlic, tomatoes, broth, seasoning, stock, pasta, and heavy cream. Cook on low, simmering until the pasta is tender. Stir in your cheese and top with green onion slices! It’s THAT easy, and oh so good. This recipe feeds two adults, three kids and leaves leftovers for lunches in our house. Which we love. So that’s it. 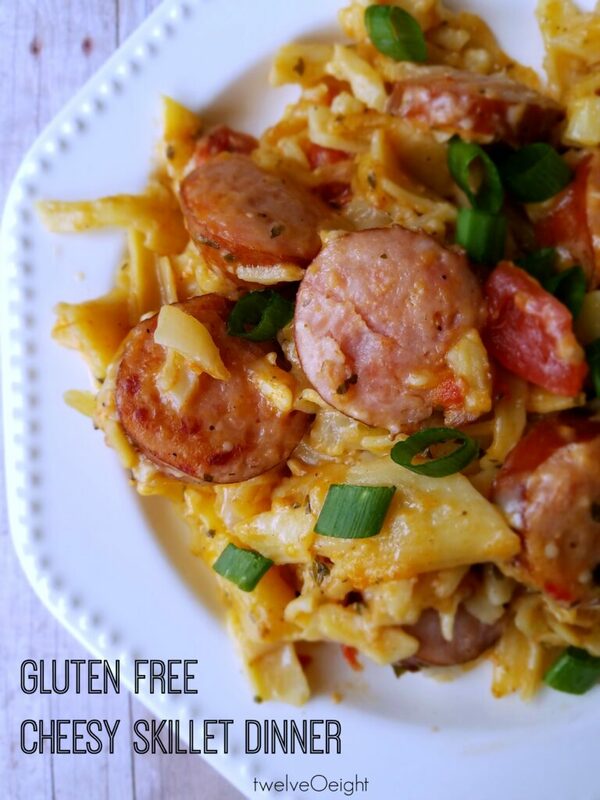 One of my favorite dishes that is on the table in 3o minutes or less, gluten free and super duper kid friendly! This looks so good. My Cowboy loves Kielbasa. This is a great new recipe to try. OMG!! These look amazing!! And tasty. What a great idea!! You’re too smart for your own good.